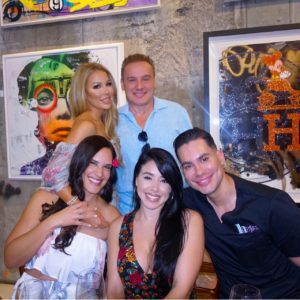 Last month, Dr. Hochstein threw a sumptuous birthday brunch in honor of his wife, Lisa, star of “The Real Housewives of Miami.” The Midsummer’s Daydream-themed party was held at Avant Gallery & LaMuse Cafe in downtown Miami. The event was filled with art, wine, and delicious gourmet food. Hochstein MedSpa provided a pop-up injectable station that offered B12 shots to guests to keep them glowing all day. 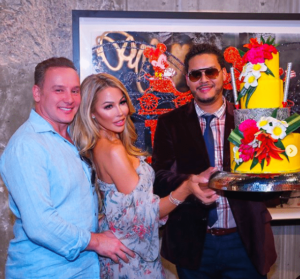 Assisted by gallery owner Dmitry Prut, the couple picked out two pieces by multi-media street artist BNS featuring icons Marilyn Monroe and Kate Moss to adorn the walls of their Star Island home. Lisa wore a beautiful two-piece floral outfit perfectly suited to the theme of the gathering. Guests included good friend of Lisa and founder of SAMBA SOL flip-flops, Carrie Johnson and her husband Jeff. Lisa getting the B12 shot at her birthday brunch!